To celebrate the Thanksgiving Holiday Break, I baked these goodies with my daughter . 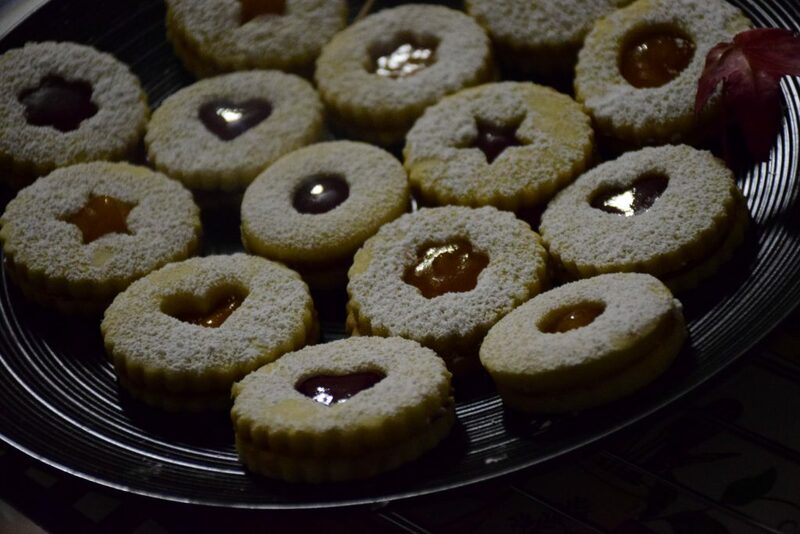 These cookies are not only kids’ favourite, but they turn out to be everyone’s dearest. My friend , Shipra once shared her love for them. So finally on the occasion of thanksgiving and the beginning of Fall colors everywhere, I baked these in two colors to symbolize Autumn. Baking cookies is always fun in our family. Since my daughter becomes a happy assistant for me and enjoys in cutting shapes and doing the tasting job for me. 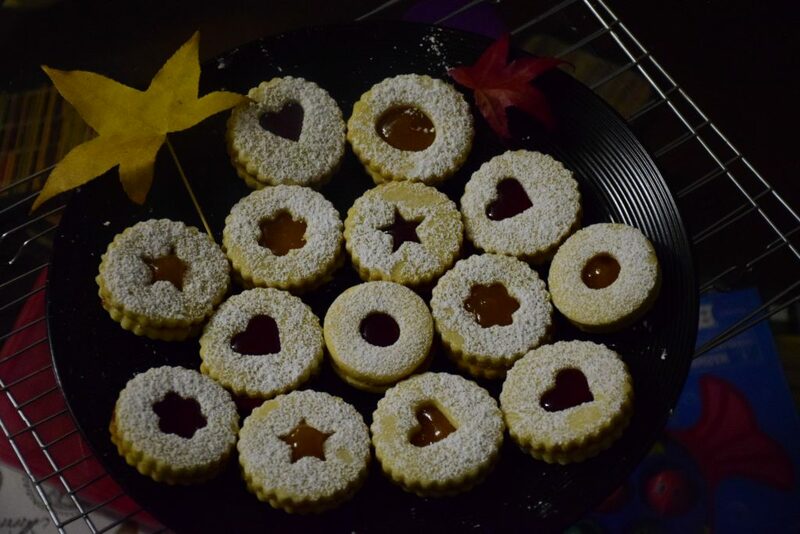 Thanks to the “Joy Of Baking” – Stephanie, from where I was deeply inspired to try this recipe. Altough I baked them egglessly and they tasted as good as the eggy ones. So lets check the recipe now..
2. Now start adding sugar in parts to it and continue whisking for 5 mins. 4. Roast the flour till it smells fragrant and you see slight change in color. In between stir the flour so that it doesn’t burn at the bottom. 5. Once the applesauce is nicely incorporated , add the vanilla and almond extract. Also add salt at this stage. 6. The almond flour would have cooled now. So add it in the wet mixture and mix it thoroughly with the whisk. 7. Now add the plain flour in parts and gently fold it in the batter. Bring all together with hands or spatula to form a dough like structure. The dough is very soft and loose at this stage. So just roll it in freshwrap or plastic wrap and tuck it in the freezer for at least an hour so that it gets firm. 8. Don’t overmix the batter after adding flour , or it will develop unwanted gluten strands in the dough. Just bring the mixture together. 9. Once the dough is firm (yet breakable and pliable) , break it into 3 parts. Keep the other two parts back in the refrigerator so that they retain their shape and firmness.Dust some flour on the rolling surface. Roll the left portion in a thick roti(bread) evenly on all sides. If the dough gets too soft while rolling and difficult to handle , keep it in the fridge again for few minutes and let it harden a bit. 13. Once you sense the baked cookies’ aroma, check their bottom and sides and take them out. Let them cool in air on a wire rack for 15 to 20 mins. 14. 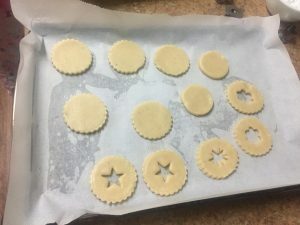 Similarly take out the refrigerated left-out dough and repeat the steps from 9 to 13 till all the dough is rolled and cut into desired shapes. 15. Once all the cookies are cooled, whisk the jams you wish to layer on the cookies with a spoon or whisk. Beat the jam to make it smooth paste. 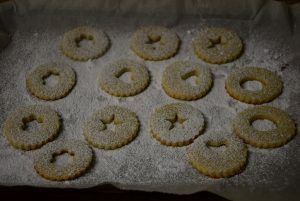 You may use a piping cone or decorating bag with a tip attached to squeeze out jam on the plain cookies. 16. Line all the center-cut cookies in a tray or plate and sift some powdered sugar through a sieve (chhalni) on their tops till they are coated in this white snow-dust. 17. Next pick up a plain cookie and invert it on the bottom side. Apply jam on the bottom side(brown side) with a spoon or butter knife or just add a blog of jam in the center. 18. 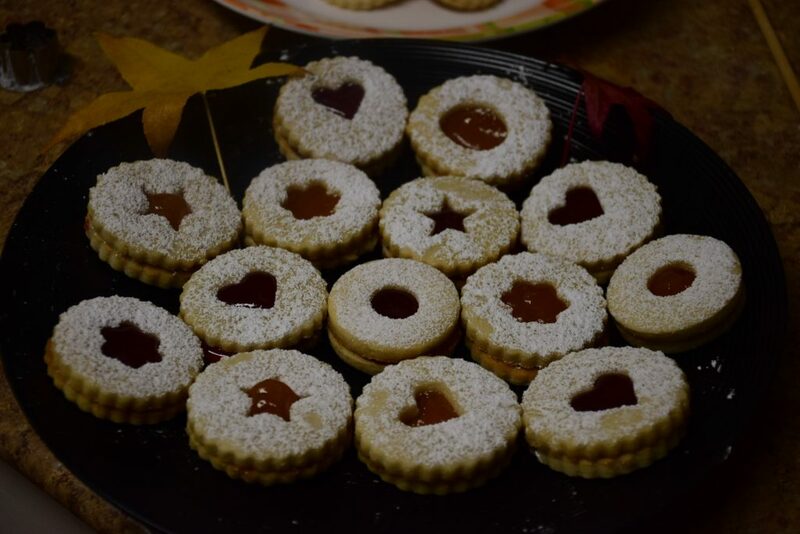 Pick one center-cut cookie and press it over this jam filled cookie to form a jam sandwich or Linzer cookie. 19. Don’t lose hope, if you are running out of jam, pick up your favourite indulgent Nutella jar. Fill in some Nutella in the cookie and sandwich it with other cente-cut cookie. 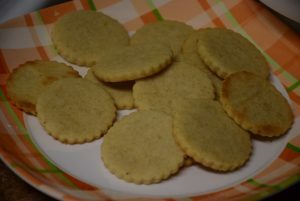 These eggless cookies are not only a treat for our eyes, but also for our bellies !! 😀 So lets have fun ,creativity and indulgence with them !!! Wishing you all a very Happy Thanksgiving this year !! 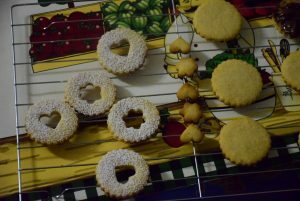 Till then keep baking and thanking..
To celebrate the Thanksgiving Holiday Break, I baked these goodies with my daughter . These cookies are not only kids' favourite, but they turn out to be everyone's dearest. My friend , Shipra once shared her love for them. So finally on the occasion of thanksgiving and the beginning of Fall colors everywhere, I baked these in two colors to symbolize Autumn. Baking cookies is always fun in our family. Since my daughter becomes a happy assistant for me and enjoys in cutting shapes and doing the tasting job for me. Thanks to the "Joy Of Baking" - Stephanie, from where I was deeply inspired to try this recipe. Altough I baked them egglessly and they tasted as good as the eggy ones. So lets check the recipe now..
Now start adding sugar in parts to it and continue whisking for 5 mins. Roast the flour till it smells fragrant and you see slight change in color. In between stir the flour so that it doesn't burn at the bottom. Once the applesauce is nicely incorporated , add the vanilla and almond extract. Also add salt at this stage. The almond flour would have cooled now. So add it in the wet mixture and mix it thoroughly with the whisk. Now add the plain flour in parts and gently fold it in the batter. Bring all together with hands or spatula to form a dough like structure. The dough is very soft and loose at this stage. So just roll it in freshwrap or plastic wrap and tuck it in the freezer for at least an hour so that it gets firm. Don't overmix the batter after adding flour , or it will develop unwanted gluten strands in the dough. Just bring the mixture together . Once the dough is firm (yet breakable and pliable) , break it into 3 parts. Keep the other two parts back in the refrigerator so that they retain their shape and firmness.Dust some flour on the rolling surface. Roll the left portion in a thick roti(bread) evenly on all sides. If the dough gets too soft while rolling and difficult to handle , keep it in the fridge again for few minutes and let it harden a bit. Once you feel the baked cookies' aroma, check their bottom and sides and take them out. Let them cool in air on a wire rack for 15 to 20 mins. Similarly take out the refrigerated left-out dough and repeat the steps from 9 to 13 till all the dough is rolled and cut into desired shapes. 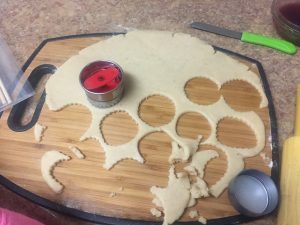 Once all the cookies are cooled, whisk the jams you wish to layer on the cookies with a spoon or whisk. Beat the jam to make it smooth paste. 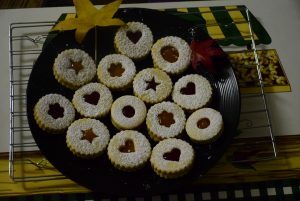 You may use a piping cone or decorating bag with a tip attached to squeeze out jam on the plain cookies. Line all the center-cut cookies in a tray or plate and sift some powdered sugar through a sieve (chhalni) on their tops till they are coated in this white snow-dust. Next pick up a plain cookie and invert it on the bottom side. Apply jam on the bottom side(brown side) with a spoon or butter knife or just add a blog of jam in the center. 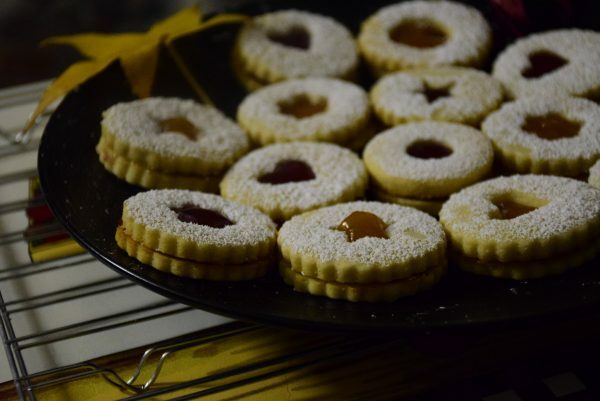 Pick one center-cut cookie and press it over this jam filled cookie to form a jam sandwich or Linzer cookie. Don't lose hope, if you are running out of jam, pick up your favourite indulgent Nutella jar. 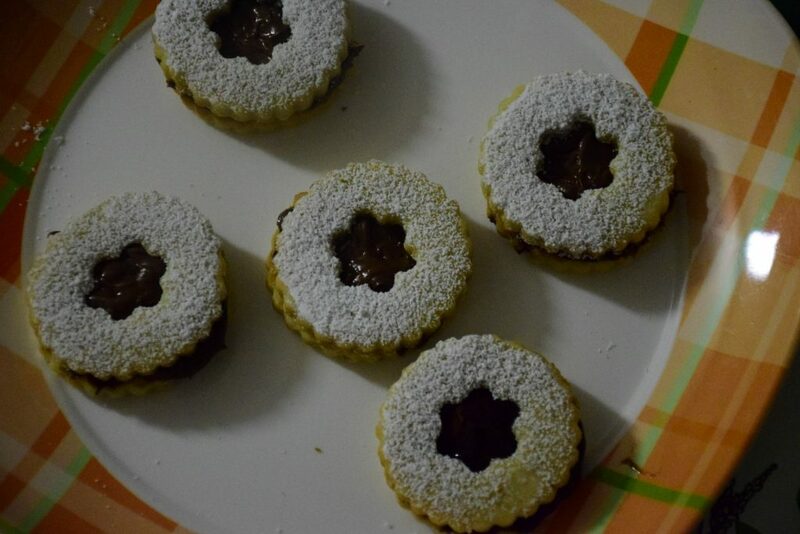 Fill in some Nutella in the cookie and sandwich it with other cente-cut cookie. This entry was posted in Desserts, Food, Kids- Favourite, Recipes, Snacks and tagged almond extract, APF, applesauce, Austria, Autumn begins, bakes in 8 mins, breakable, Carenshare, Christmas special, City of Linz, crunchy, easy, eggless, Fall Special, filling, gluten-free, hand-whisked, Indian, Inspired from Joy of Baking, jam of choice, lemon zest, lime zest, luscious, maida, My friend's favorite, no hand-held mixer, no stand mixer, Nutella, only a silicone whisk, pliable, powdered sugar, shiny jam filling, shweta jindal, soft, soft dough, Stephanie, sweet, Thanksgiving Kids' treat, unsalted butter, winter special, zindagisikhati.